Time to try out another of ColorFabb’s PLA/PHA filaments, this time it is a Woodfill Fine filament that contains actual wood particles – about 70% ColorFabb PLA and 30% recycled wood fibers. 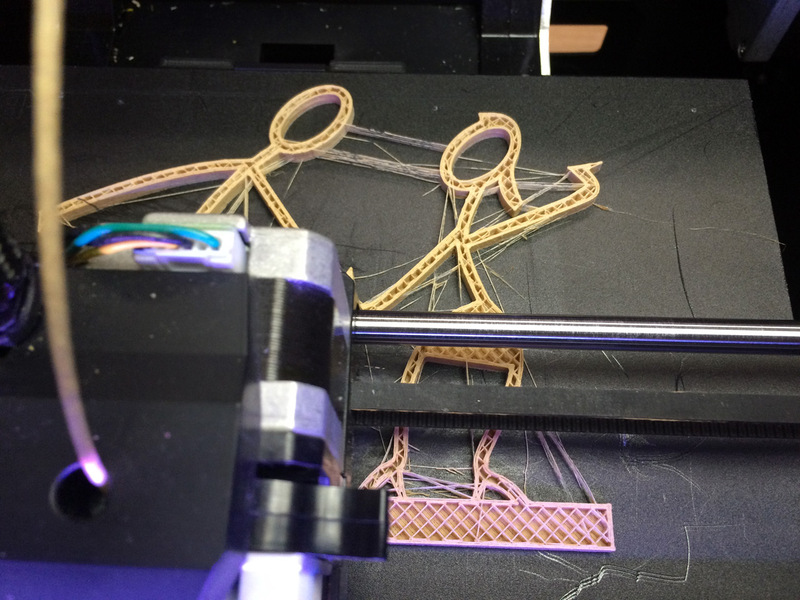 The end result from printing with this filament is a 3D printed object that feels like it is made from wood and looks like one, it is also lighter than the same print using only plastic filaments. ColorFabb uses fine pinewood fibers for this filament that are mixed with their PLA/PHA filament acting as a binding agent and the combination does seem to work pretty well. 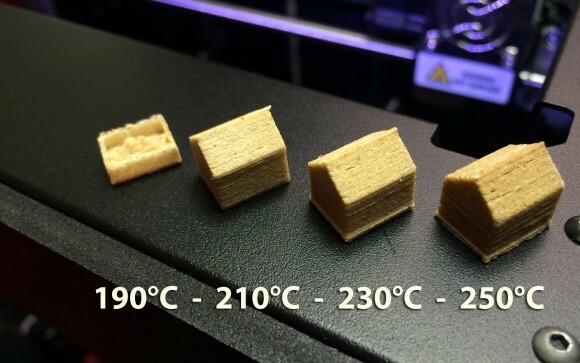 The box of the filament says recommended printing temperatures are 190-210 degrees Celsius and the official website mentions 195-220, 40-100 mm/s printing speed and if a heated build platform is available to set it at 50-60 C, though it is not specifically required. We have tested printing with ColorFabb WoodFill Fine filament with a temperature of 190, 210, 230 and 250 degrees Celsius – outside of the recommended values to see what we are going to get as a result. The MakerBot Repilicator 2 3D printer that we are using was set to print with 0.2 mm layer height and 90 mm/s extrusion speed. Last year we have tested the Orbi-Tech LayWoo-d3 3D Printer Filament that was similar to the WoodFill from ColorFabb, but there were distinct differences between the two. At 190 degrees Celsius the ColorFabb WoodFill was having some trouble printing properly and we were getting filament jams inside the nozzle, going for 210 to 230 degrees things were fine in terms of printing and even at 250 the results were acceptable though the quality was not so good. We should note that around 210 degrees Celsius is probably the best temperature as with higher temperatures the filament is oozing too much from the nozzle and that requires a lot of cleanup work for larger models as you can see on the photo above. Also, unlike with the Orbi-Tech LayWoo-d3 where extrusion temperature affects the color of the printed object, with the ColorFabb Woodfill there is very little variation in color of the print using different extrusion temperature. The good thing however is that you can use standard printing speeds and settings with this filament just as you would with a normal PLA/PHA plastic only filament from ColorFabb.